Back in 1995 only about nine percent of all US workers telecommuted to work. Telecommuting is another way to say that these peopleworked from home, were part of a virtual office, or were part of an electronically distributed workforce. In the decade that followed after 1995, that number of employees working in virtual offices skyrocketed up to 30 percent. Now, what Gallup doesn’t really quantify in their report here is the impact that startup companies have on this statistic. While telecommuting and working from virtual offices might be “more the exception than the rule” in the US, in startup culture it’s incredibly common and we see it a lot. It has its benefits, but at the same time working from a virtual office can be a hindrance to productivity. Not to mention, trying to run a virtual office as a CEO or COO can be incredibly difficult. Despite the myriad challenges that surround virtual offices though, we see companies work with it and manage to find success. “SUMO Heavy is made up of a team of remote workers, spanning New York, Philadelphia, Los Angeles, and Poland. We work remotely because it enables us to limit distractions, work on our own time, and broaden our horizons for hiring. But, there are some issues we encounter as a remote team. “I work virtually for my own online consulting startup, PlacesBrands, which I founded in 2012. I’m based primarily in Istanbul, Turkey, but I work with clients and colleagues from all over the world. I have also been employed by a virtual company in Sweden, and have worked remotely as a freelance journalist. As well as working from home, I have worked from co-working spaces in Istanbul, London, Brussels and Munich. Sometimes I work in airport lounges too. As a virtual worker, I take advantage of my flexibility to travel as much as possible. “I’m a Principal at Firefield, and we work with startups, entrepreneurs, and enterprises to build their web products. We are a completely remote team: I’m in Davis, CA, but we have people in New York, Boston, Spain, Poland, and Russia. Many of our clients are on the East Coast. Our biggest challenges are communication and working in different time zones. We find that even though we work at different times, we needed to find a way to all be online and have a daily standup with at least a couple hours of full team overlap. This means we’re flexible on hours, but whether it is at the end, beginning, or middle of your day, you’ll be expected to check in with the entire team and be accountable for what you’re working on and answer questions. When working remotely there is a tendency to work at strange hours; this should be fought. Everyone should work set hours so others on the team know what to expect when. This means I start my day at 6am PST and since I also am working with East Coast clients, it pays to be on their schedule. As a product manager, you learn to keep agenda items for each person you work with as you know you might only have one chance in a day to communicate with them. “We were virtual our entire first year in business. The biggest challenge we saw was in being able to collaborate effectively. Startups move fast and it can be hard enough to stay in the loop on things when you’re all in the same room. Add working remotely to the mix and you and your team won’t just be on the wrong page you’ll be on completely different books. Embrace the Small Talk and Chit-Chat Online: When workers aren’t in the same office they often don’t have the same small talk and chit chat that allows them to relate to each other on a personal level. Opening up internal communication platforms like Slack and HipChat, and encouraging workers to express themselves outside of work dialogue (hello GIF’s! ), is important. Reply-All On Purpose (No, Really! ): We’ve all seen the horrors of the mistake replay all email, but replying all to questions from workers outside your own office can show your business acumen and also your personality. Don’t always worry about filling up every ones email inbox. 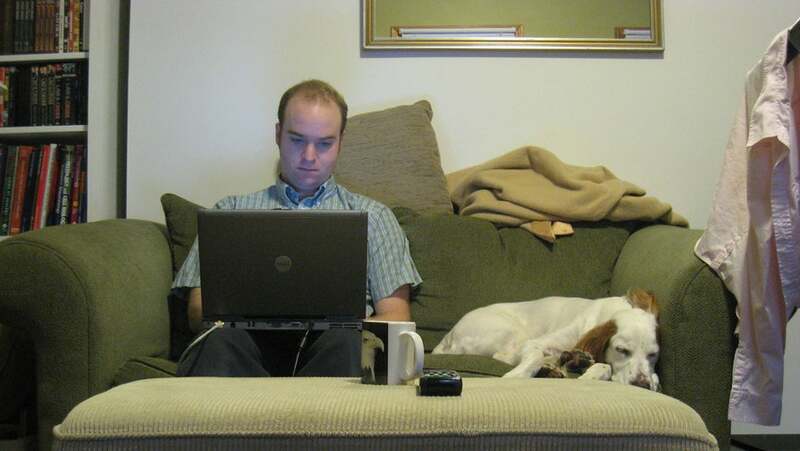 “Research what it’s like to work from home: it’s not just you taking your computer home. It’s not that easy, and you could fall into bad habits. Another challenge is getting motivated to actually start work each day. There are many things at home to distract you. If you dress like you’re going to an office, it’ll give you a mental boost. It’s also easy to over work when you’re not in an office punching a clock so I suggest taking breaks. To break up the isolated set up, make it a point to talk to coworkers, and not just about work matters. Corporate culture is a big deal, so small things like The Water Cooler, one of the tools PeopleG2 offers, are a big deal. It’s a dedicated chat room for small talk and to give each other virtual high fives for special achievements.